Keira Knightley as Sabina Spielrein. 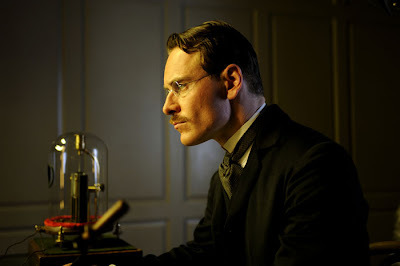 I had the pleasure of going last night to see the movie A Dangerous Method directed by David Cronenberg, which is based on a true story about Carl Jung, his mentor Sigmund Freud, and Sabina Spielrein, a psychiatric patient who came into their lives. 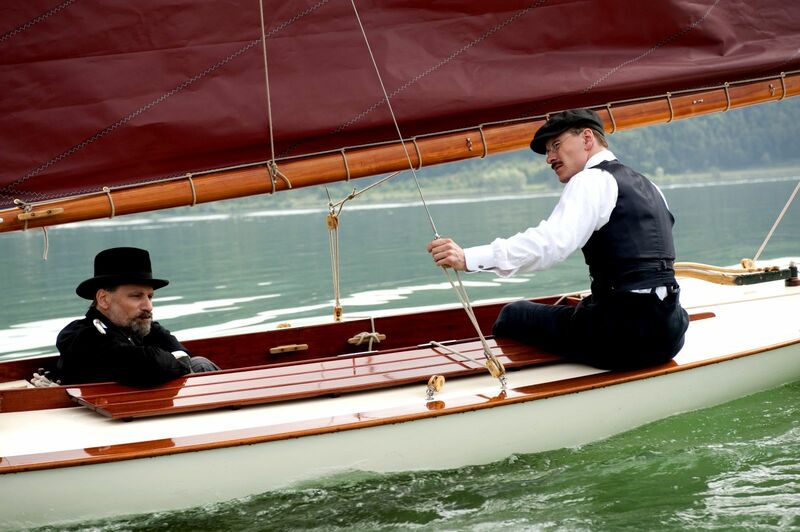 The movie has been out for a while, and there were about six people in the little theater, but what can I say; this movie about interesting historical people at the turn of the last century is more my speed over something like Hunger Games which the rest of the world is seeing right now. 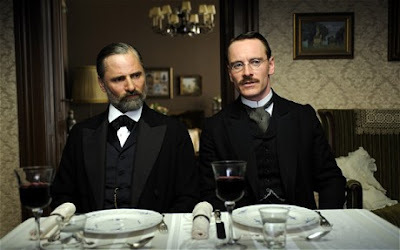 Viggo Mortensen (left) plays Sigmund Freud and Michael Fassbender (of Shame fame) is his protege Carl Jung. Set from 1904-1913, the move captures the Edwardian era which I love. The men wear black jackets, vests and ties, and white shirts, striped grey and black morning trousers, and black gloves. Elegant. The interiors are quite beautiful - this is Dr. Freud's office where the men meet and talk. and Keira Knightley, of whom I have been a fan since Pride & Prejudice, is quite a gorgeous mental hospital patient. There are some compelling scenes in this movie, including a trans-Atlantic voyage for Freud and Jung on an ocean liner. 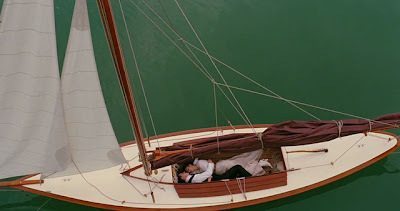 In New York Harbor they sail past the Statue of Liberty, and the six of us in the movie theater nodded in the dark, "Yes, New York is the place to be." It's a cerebral movie, as Freud and Jung discuss the ideas that give birth to modern psychoanalysis, and then fall out over their differences. And it's sad too, as the love affair between Jung and Sabina ends unhappily. 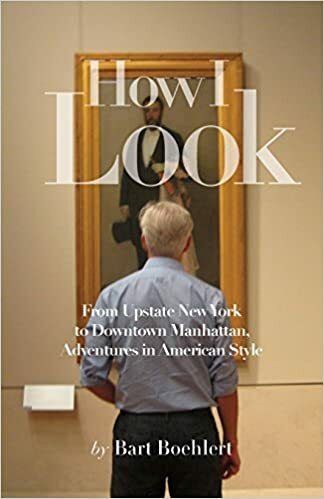 So this is not a fun, date night "rom-com" but, like the movie Coco & Igor, I did enjoy a visit to an elegant and civilized time gone by, and learning more about important figures in history. I, too, enjoyed this movie. But, um . . . it's "Sabina," not "Sabrina." I've heard so much about this movie and how wonderful it is for the actors. I will definitely see it now. Thanks for another great post. Splenderosa, The acting is pretty great, especially mad Keira in the beginning with her German accent. Sarah, you will like it! This looks like my cup of tea for a rainy Sunday afternoon. Thanks for the tip. Had not heard about it.